A recent peace initiative in Myanmar’s eastern Shan State could play a key role in poppy eradication in a country which is the world’s second largest opium producer, experts say. The plan, involving the Burmese government and its military, an armed ethnic group in Shan State, and UNODC, will allow survey staff into Shan State, responsible for 90 percent of the country’s poppy cultivation. Despite past government efforts to rid the country of poppy, the rate of cultivation has steadily risen over the past six years, experts say. The government has vowed to partner with the Restoration Council of Shan State (RCSS) whose Shan State Army (SSA) fought for greater autonomy since 1964 before signing a ceasefire with the central government in 2011. In current peace talks, both parties and the UNODC agreed to help destitute farmers with alternative development programmes. The anticipated multimillion dollar plan, slated for 2014 to 2017, will aim to improve the state’s infrastructure, health, education and crop substitution, said Eligh, who added that UNODC has worked with the Burmese government and armed groups before, but not in an active role during a peace process. The World Food Programme estimates that the state had the nation’s third highest food poverty level at 9 percent. Within the context of efforts by the Association of Southeast Asian Nations (ASEAN - Myanmar is a member) to make the region drug free by 2015, the Burmese government announced the new approach to fellow members at a 9 May drug control cooperation meeting in the capital Naypyidaw. There, Minister of Home Affairs Lt-Gen Ko Ko told delegates that alternative development was the “fundamental solution” to reduce poppy cultivation, and called on international support and donors for funding. However, the ceasefire between the government and SSA remains fragile and skirmishes continue. Fighting against other armed ethnic groups in opium-producing zones is also a hurdle for Myanmar, which accounts for 23 percent of the world’s poppy supply. According to the 2013 UNODC world drug report released on 26 June, the country is also a major source of amphetamine-type stimulants. Drug experts view the increased levels of opium as a growing threat to human security in neglected border regions, where roughly 300,000 households grew poppies in 2012, up from 256,000 the year before, an earlier UNODC report said. This summer, UNODC officials will conduct an assessment of SSA-controlled areas to gauge what projects need to be carried out in Shan State. Chairman of the RCSS Lt-Gen Yawd Serk told IRIN that for projects to work, they must be implemented “through the participation from the people”. Rural, rugged Shan State, which covers almost a quarter of the country and shares porous borders with China, Thailand and Laos, offers drug-traffickers several routes into foreign markets. Poverty and instability make illegal activity all the easier. In 1999, the government launched an ambitious 15-year drug eradication master plan that initially had success with an 83 percent drop in poppy cultivation in its first eight years. Nevertheless, insufficient alternative livelihoods, plus the fact that dry opium’s market value is 19 times more than rice per hectare, pushed many farmers back to poppies, according to UNODC officials. A drug watch report by Shan Herald Agency for News (SHAN), run by Shan exiles in Thailand, said the opium trade is entrenched among poor farmers, rebel groups and pro-government militias who need to financially support their units, and drug syndicates who “take advantage of the state of affairs to invest, produce and trade in drugs”. The upsurge of heroin use in parts of Asia, particularly in China, where there were 1.24 million registered heroin users in 2011, has also created greater demand for opium from Myanmar and even Laos, which grows about 3 percent of the world’s poppy plants, according to the UNODC drug report. Compared to historical figures, the present rate of poppy cultivation is still considered low. In the 1980s, Myanmar was the top global opium producer until Afghanistan took over in 1991. 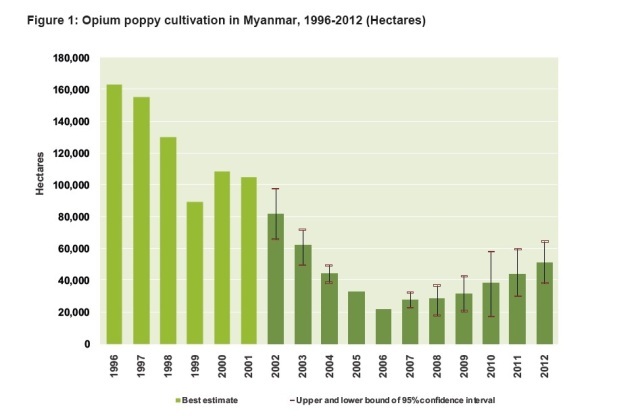 At the start of its drug eradication plan, Myanmar was growing poppy on roughly 100,000 hectares annually, before it dropped to 21,600 hectares in 2006 and then rose again to 51,000 hectares in 2012, according to UNODC. Burmese officials were confident of stamping out all opium production by 2014, the final year of its plan, but in October 2012 they backtracked and extended the deadline to 2019. They said drug eradication was a “national duty” and requested help from local people, NGOs, the private sector and UN agencies to implement anti-drug campaigns, the Myanmar Central Committee for Drug Abuse Control (CCDAC) reported. Meanwhile, allegations of crooked factions within the Burmese military, called the Tatmadaw, have hampered progress. “The Tatmadaw has been giving cover to the drug traders and committing most [of the] corruptions,” said Lt-Gen Serk. At the same time, national leaders have been accused of supporting the drug trade, with seven “drug lords” serving as members of parliament for the ruling military-backed Union Solidarity and Development Party, led by reformist President Thein Sein, according to SHAN. Many poppy farmers cultivate the illicit crop due to conflict and poverty. Education and health facilities are inadequate, and the few roads mean access to markets to sell legitimate crops is difficult, whereas drug-traffickers come to farms to buy poppy harvests, experts say. In 2012, at least 45 percent of poppy farmers told those conducting surveys in Myanmar that they grew poppies to get more cash for food. “Opium is the safest and most profitable cash crop,” said Shawn Kelley, a UNODC analyst based in Bangkok. Still, poppy farmers do not become rich. Drug-growing farmers earn roughly 1 percent of the global illicit drug income. In Myanmar and Laos, a poppy farmer can make just US$200 per year. Drug traffickers rake in much of the profits by exploiting these socially and economically marginalized farmers, according to the Alternative Drug Report, a critical assessment of the global war on drugs. The report says “alternative development” does not impact overall drug crop production: any localized programmes only displace production and its problems to other regions or countries. Ohnmar Khaing, coordinator of the Food Security Working Group in Myanmar, an umbrella group of national and international NGOs, argued that limited efforts have failed to fix the poppy issue. She told IRIN poppy farmers may find alternatives or other professions but it will need “investment and encouragement of regional governments and relevant stakeholders”. UNODC says 95 percent of Shan State villages did not receive agricultural aid in 2012. Although optimistic on the potential build-up of alternative development in Shan State, Khaing said she worried the programmes could be marred by poor coordination and lack of transparency. In 2009, UNODC began at least two food security projects in the state, worth roughly $5 million for about a five-year period. The projects seek to reduce opium cultivation, improve roads, health care and education, yet they only cover 10 villages. Depending on the situation, it can take up to a decade for an area to become sustainable, experts say. Whether the current ceasefire will hold long enough for a robust programme in Shan State remains unclear.